London based Sheraz draws on his life experiences in a fresh, forthcoming style using humble self-depreciation blended with brilliant comic delivery. His likeable personality will make you laugh and then want to go for a pint with him after the show. 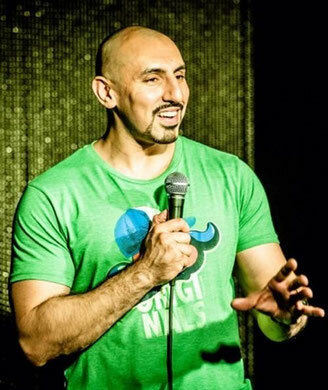 During his time on the comedy circuit Yousaf has performed in clubs such as Jongleurs, The Comedy Store, Downstairs at The Kings Head, Bearcat. Laughing Horse, Backyard Comedy and Soho Comedy. As well as performing sets he is also a very capable compere/MC and has received many great testimonials from clients/promoters (see below). Every six weeks he performs a one hour show at The Comedy Pub in London. As well as performing live stand up Sheraz was also the breakfast radio host on Buzz FM (40k listeners) and he was recently filmed for the "Laugh Out Loud" show on BritAsia TV. Sheraz was a true professional, taking control of the night, organising the other comedians and dealing with a proper diva. As for his performance he worked the crowd well with a good mix of light hearted mickey taking and local banter. "Grab him while you can. That's exactly what I did. Booked him a gig at the Crowne Plaza in Heathrow and he was a huge success. As an agent, I found Sheraz reliable, helpful, patient and easy to work with. No nonense, completely professional,so I will definitely be booking him again.